The latest edition of the magazine I am delighted to be a contributor for has its latest issue available now. And it has had a name change! It’s still nb but that now stands for nudge-book to tie it in with its associated website (www.nudge-book.com) where I am the “Community Voice” for the Book Hugger section. You may think, oh here he goes, pushing a magazine he is writing for and okay, I hold my hands up, but I was reading nb long before I was a contributor and it is the only UK magazine out there for readers and reading groups so it is well worth supporting. In this issue we say goodbyes to our editor and publisher, Guy Pringle, who has done a fantastic job in ensuring such a magazine can survive in this digital age and after 17 years at the helm has decided to start his well-earned retirement. We are all sure that it will continue to go from strength to strength under Mel Mitchell who has also worked tirelessly on the publication for a number of years. If you head over to the nudge bookshop you can purchase a copy (or take out a subscription). This edition has features a Crime Fiction Supplement and much else besides. There’s an interview with Graeme Macrae Burnet whose Man Booker shortlisted “His Bloody Project” I so loved. There’s an interview with Clare Mackintosh who became the fastest selling new crime writer in 2015 with “I Let You Go”. Her latest, “I See You” is available as a Recommended Read and is available free for nb readers from the nudge website (you just pay p&p). There’s a couple of exclusives from me as well. You can find my interview with Charlie Lovett whose “Lost Book Of The Grail” and “The Bookman’s Tale” both delighted me this year and there is a feature on TV adaptations. You can also find out the NB books of the year as voted for by readers. Just one spoiler here as I am so delighted that my five star rated “Owl Song At Dawn” by Emma Claire Sweeney was voted the Book Hugger Book of The Year. There does seem to be more content in each edition of nb, so if you haven’t seen it for a while give it a go. The directory at the back of the magazine features reviews of a whole range of books which might have escaped your notice. If your “To Be Read” list is looking a little lacklustre and out of date then let nudge books give you a nudge……………. I am aware that I’ve been a little slow off the mark here telling you about the latest newbooks magazine. I can only put it down to wanting to tell you about some of the books shortlisted for the Nudge/newbooks Bookhugger book of the year. There is now just one day to cast your vote- as a reminder here are the selections. Small Great Things – Jodi Picoult. My five star review for this is here. Exposure – Helen Dunmore – My five star review for this is here. The Wonder – Emma Donoghue – My four star review is here. The Song Collector – Natasha Simons – My four star review is here. How To Measure A Cow – Margaret Forster – My three star review is here. Owl Song At Midnight – Emma Claire Sweeney (I am currently reading this and enjoying it very much, my review will follow shortly). If you have read any of these books and think they are worthy of the title of Bookhugger Book Of The Year you have now just a few hours (voting closing on 10th Feb) to head on over to the Nudge site (here) to register your vote. I must confess that for this issue of newbooks I did not contribute as much as I have done in the past. That was because of moving home (twice in a short period of time) and losing contact with the rest of the world with no phone line, mobile phone signal or internet (something which I have griped about before on here, and which I have now just about got over). There is a lot of great stuff to read in this latest edition of newbooks which can be purchased as an individual copy or as a subscription over on the nudge site (just click here). There’s a great feature on authors’ new years resolutions (I wonder how many of them have already been broken). Those contributing include reviewsrevues favourite Chris Whitaker (good to see that sense of humour still going strong, Chris), Sara Baume and Natasha Solomons. The big interview and cover author is Claire Fuller, who is interviewed by Mel Mitchell, who also does a great job with author Magdalena McGuire. A section on debut authors focuses on Joseph Knox, Katie Khan and Ross Armstrong as well as rounding up the debut novels that are going to be appearing over the next couple of months. There is also an extract from the book I am currently reading “Owl Song At Dawn” and interview with author Emma Claire Sweeney. There are loads of books reviewed in the Directory for those of us looking for the next great discovery. There’s also the Recommended reads which can be picked up from the Nudge website for free (you just pay P&P). These are subject to availability and include the aforementioned Emma Claire Sweeney (this is where my copy came from), Foxlowe by Eleanor Wasserberg, The Bones Of Grace by Tahmima Anam and Life In A Fishbowl by Len Vlahos. If your to be read list is looking a little depleted (as if!) or you just want to experience one of the only print magazines about books still available in the UK check out Newbooks 91. I’m pleased to say that this has been the busiest month ever on reviewsrevues.com with lots of new visitors and followers from all over the world. A considerable number have been attracted by my review of the ITV series “The Level“, which in under three weeks has become by far my most read review of all time and many have, happily, stayed around and looked at other things whilst they are on the site. So, with new people around I thought I’d take the opportunity to mention newbooks magazine and the associated nudge website, both of which I am involved with. I am the lead contributor for literary fiction in the magazine and the community voice for the Bookhugger section of the website. The magazine is published four times a year and the latest edition has just arrived. The featured author in the black and white photo on the cover is Jodi Picoult and there is an interview with her inside on the publication of her latest book “Small Great Things.” There is also an exclusive from me, an interview with Jess Kidd whose “Himself” I enjoyed and reviewed recently. There’s also a piece on “Black Narcissus” which compares the book to the film, which you also would not have read anywhere else before. If you are looking for book ideas for Christmas, Jade (Book Geek) Paul (Book Life) and myself (Book Hugger) are ready to help. To meet press deadlines I was researching books for Xmas whilst the sun was blazing down (remember that day?) so I have been anticipating the publication of the books I selected as good present choices for some time. If anyone wants to get hold for me any of the books I’ve highlighted for Xmas they would be most welcome!! Also it was good to see contributions from a couple of other wordpress bloggers, both of whom I have been following for some time. Bookish Beck has highlighted, as I also have, a Christmas book by Jeanette Winterson, which may very well become a seasonal perennial. There is also an interview with Simon Savidge of Savidgereads who has been blogging for a number of years and who is always worth a visit. If I haven’t tempted you enough there is also the opportunity to get hold of four free recommended reads by just paying the postage. There is the aforementioned “Himself”, together with “The Return Of Norah Wells” by Virginia McGregor, “Dragon Games” by Jan-Philipp Sendker and “The Curious Charms Of Arthur Pepper” by Phaedra Patrick. There are articles on all of those books. With Man Booker Prize announcement imminent there are a collection of my reviews from the short/long lists (“His Bloody Project” for the prize please). If you haven’t checked out newbooks for a while. This is a magazine that is getting better and better. This edition and back issues can be purchased by visiting the shop on the Nudge website either as a single copy or more sensibly by taking out a subscription. Happy reading! The latest issue of newbooks magazine (nb89) dropped through my letterbox this week. For those of you who are not familiar with it (where have you been?) this is the only magazine readily available in the UK for readers and reading groups. It is published four times a year and despite the weather telling us otherwise, this is the summer edition. I am thrilled to be a listed contributor to this magazine and its sister website Nudge. This edition and back issues can be purchased by visiting the shop on the Nudge website (follow the link here) either as a single copy or more sensibly by taking out a subscripton. In this issue there’s lots of ideas for summer reading and there’s still a lot to get excited about. The featured author on the cover is Jessie Burton, whose latest book “The Muse” is a recommended read and is available to magazine readers for just the payment of postage and package. I still have Jessie’s last book “The Miniaturist” on my shelves, patiently waiting its turn. I will get round to it as I have read and been told so many positive things from those who have experienced it. Elsewhere there’s an interview with Emma Cline, who has reputedly got a large advance for her Charles Manson family based novel “The Girls”. Annabel Abbs (“The Joyce Girl”) picks the five novels which turned her into a writer and Alison Moore (“Death And The Seaside”/ “The Lighthouse”) picks five favourites which feature outsiders. There are features on the Baileys Prize, the non-fiction Wainwright Prize and the International Dublin Literary Awards. There are lots of suggestions for reading across various genres- including suggestions for that holiday suitcase and a thorough set of reviews in the Directory pages. And for regular readers of reviewsrevues.com, there are a few exclusives that you have not seen on this site. I recently read and reviewed “Rembrandt’s Mirror” by Kim Devereux. In the magazine you can read my interview with Kim in which she spills the beans about bringing the genius artist and seventeenth-century Netherlands to life. Also, I take a look at both the film and novel of “Rosemary’s Baby” (my review of my re-read of Ira Levin’s novel is here). There’s also a feature on the Apollo Classics series I have been reading over the last couple of months (the most recent review of these is here). And then there’s the book extracts and free books (just pay p&p). The featured books this month are the latest by the aforementioned Jessie Burton and Kim Devereux, crime novel “Try Not To Breathe” by Holly Seddon and Cornish mystery “Black Rabbit Hall” by Eva Chase. Persuaded yet? When I discovered that newbooks magazine would be having a Maggie O’Farrell retrospective (nb 88- available now from here) I thought I would go some way to putting right the oversight which means that up until now I had not read any of her books. I found her 4th novel dating from 2006 sitting on the local library shelves and although this was my first Maggie O’Farrell it will not be the last. Esme has been incarcerated in a psychiatric hospital for over sixty years. When the hospital is due for closure her grand-niece who has never heard of Esme’s existence takes responsibility. This is a beautifully written novel imbued throughout with a sense of what might have been. Esme’s life before her time in hospital flashbacks through her mind, her sister Kitty’s thoughts ramble in the haze of Alzheimer’s and Iris, the niece, has her own issues holding her back. It is a novel of restraint, both in how the characters have been held back by their circumstances and the spare effective style. I felt completely captivated by Esme’s unpredictability and her personal tragedies and was horrified by her family’s ignorance and ill-treatment of her .O’Farrell builds the story beautifully and the plot twists and turns are shocking yet realistic. Motives and actions that might seem far-fetched in the hands of less talented writers are made convincingly plausible. I found it very difficult to put the book down and the catastrophe of Esme’s needless sixty year hospitalisation will stay with me for some time. I love an author willing to let a cat in on the act! Maggie O’Farrell is from Northern Ireland and currently lives in Edinburgh. She won the Costa Best Novel award in 2010 for “The Hand That First Held Mine”. In 2013 she was shortlisted for the same prize for “Instructions For A Heatwave”. Her latest novel “This Must Be The Place” is published in May 2016. I have some catching up to do. The Vanishing Act Of Esme Lennox was published in 2006. I read the hardback published by Headline. The paperback is published by Tinder Press. Yesterday I did something new. I visited the London Book Fair for the first time. I was invited by the good people of AMS Digital Publishing who run the Nudge website and newbooks Magazine, both of which I contribute to. The Fair is running this week at London Olympia. Coincidentally, just this weekend I watched a Clint Eastwood Hollywood movie from 2010 “Hereafter” starring Matt Damon where the plot climax came as the main characters encountered one another for the first time at …The London Book Fair. Now Hollywood had relocated this at Alexandra Palace (very familiar to me as I used to be Headteacher of the Primary School which borders the Palace’s grounds) and envisaged the event as Derek Jacobi (playing himself) reading Dickens whilst a handful of people stood around clutching a book to be signed. Now, I knew it wasn’t going to be like this but somehow the image must have crept into my brain as when I entered the conference hall I was quite overwhelmed by the size and scale of the event. It was a perfect opportunity for me to meet for the first time Guy, Mel and Alastair from AMS Digital and Paul and Mike who are the “Community Voices” for the Book Life and Book Noir strands of Nudge, if only I could find them……. Well, I did and it was great to meet them and gave us a chance to sit around the table and talk about books –so a very productive way to spend a few hours. The Fair itself was fascinating, although most of the time I did not know what was going on! Many publishers were there seemingly all having meetings, there was a lot of talking around desks about things like distribution rights and other deals going on which need not disturb the minds of us humble readers. There were lots of books on show but quite often out of reach of the grubby mitts of the Festival goers- I only picked up a couple of books the whole time I was there. I did, however, get a number of very useful catalogues which will let me know what is happening in the world of books over the next few months. I also did not know that there is now a Foyles Bookshop in Waterloo Station where I spent a happy quarter of an hour or so whilst waiting for connections. I’ve probably had my little fix of London now and am back on the Isle of Wight where the pace is considerably…………(exhales)….slower. Whilst on the subject of my good friends at newbooks. Timed beautifully with the London Book Fair is the latest issue (nb88) which is out now and can be purchased from the Nudge website by following this link. Featuring Peter James on the cover (who looks different in my imagination) it is full of many good things which need your serious consideration. The winners of the various books of the year are revealed in the genre categories and also the Reading Group Book of the Year. There are also interviews with the above mentioned Mr James, Chris Cleave (whose new book sounds fascinating) and Holly Seddon and there’s a considerable amount of me as well, most of which you will have not read on reviewsrevues.com. If you are familiar with the Nudge site you will know that it is divided up into sections and now each section has its own champion –a community voice. I am that person for the Bookhugger section (literary fiction) and there’s also Reg (Book Chap), Jade (Book Geek), Paul (Book Life), Sheila (Book Diva) and Mike (Book Noir) ready to be introduced to you. We have all produced a piece for the magazine for you to get to know us a bit better as readers. I have also written a piece especially for the “Script” section which compares the film version of “Atonement” to the book (my review of the book is here). There’s also the chance to get hold of for free (just p&p to pay) the recommended reads, which is a particularly impressive selection this issue- “Black Eyed Susans” by Julia Heaberlin (racing up the Bestsellers chart as I write this- Top 5 in the Official UK Top 50 books), Chris Cleave’s latest “Everyone Brave Is Forgiven”, Laline Paul’s “The Bees” and Eva Holland’s “The Daughter’s Secret” – something for everyone there. Which would be your favourites from the shortlist? But what can I find by our esteemed reviewsrevues writer I hear you ask?! Well, in this edition you will find my overview of the Bookhuggers year, another recommendation for my Book of the 21st Century, reviews of a couple of books from the Costa Award shortlist and a review of Garth Risk Hallberg’s “City On Fire”. Surely that’s worth the subscription fee alone!! The new issue of newbooks magazine (issue 85 Summer 2015) has just been published. Why the shameless plug? Well…………..Inside you will find a double page spread about the setting up of this very blog together with my blog post “Keeping The Libraries Open!” I have also contributed two exclusive reviews which have not appeared anywhere else. One is my suggestion for the Best Book of The 21st Century (so far), Michel Faber’s “The Crimson Petal And The White” and the other is the newly published “Wolf Wolf” by South African writer Eben Venter. 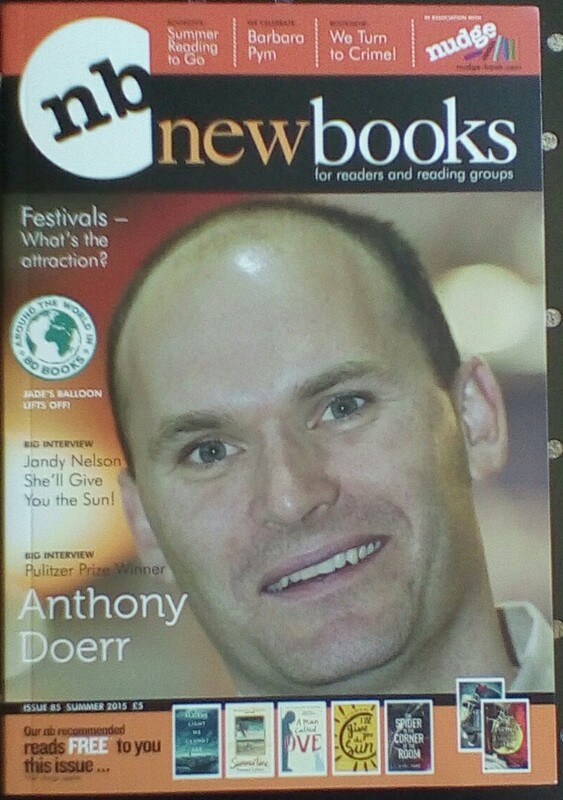 Also in the magazine is an interview with the Pulitzer Prize winning Anthony Doerr, YA author Jandy Nelson also David Mitchell, Erica James, Frederick Backman, Rosie Thomas and much more. There’s also the opportunity to get hold of seven of the featured books for free (just by paying the postage!). If you’ve never read newbooks magazine it is one of the few print magazines for readers and reading groups. If you haven’t seen it for a while it had a relaunch three issues back and is now better than it has ever been before with so much to read.